She stood at the window of her little ramshackle home, looking out to the grey morning sky laden with the burden of clouds waiting to burst. Her calloused hands clutched at the crumbling wood of the window-sill, more out of habit than a need to feel the rotting timber against her palm. Today would be no different. She would stand there, watching and waiting, perhaps even daring to hope, till the setting sun reminded her of the time. She could not remember how long ago it was that she had watched him leave. It felt like only yesterday that he last walked out through that door. Her heart had lurched at the site of him fading from her sight. It had been a grey, misty morning, not unlike today. She had wanted to cry, to scream, anything to stop him leaving. All she had managed was a brave smile to hide her misty eyes. Then the waiting had begun. Every day, for hours, she would stand at that window, waiting for something, anything, a letter perhaps, that would tell her that he was okay. A letter written in his hand to say he was coming back to her. That everything was going to be all right after all. There was a knock on the door. She had been so lost in the waiting, she had not noticed as the car drew up outside. A man stepped out and walked the few paces to the front door, his heavy step muffled by the mounds of snow that lay undisturbed on the drive. He was waiting as her trembling hands unlocked the door. She was not used to knocks on her door. There had been no knocks on her door. Not since he had left. "Mrs. Wilson?" There was no mistaking the tremor in his voice. She suddenly felt weary. Tired and very weary. The words were coming now, but the fog that was clouding her thoughts was drowning out the sound. But there was no escaping their harsh reality. "Sorry, Madam...Jimmy...we were in the trenches together..."
She gazed with unseeing eyes as he placed it in her ice-cold hands. It was the letter. Her son's letter, written to her in his own hand. His last letter, telling her he would be coming home soon, coming back to her. And that everything was going to be okay. 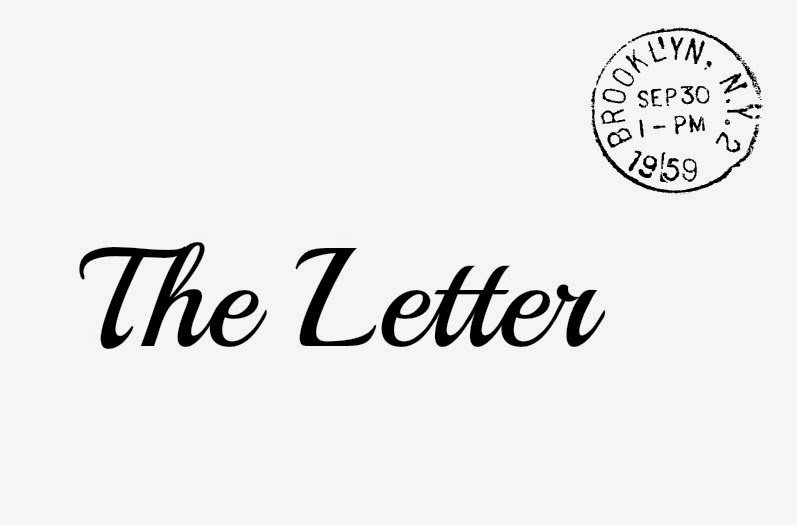 She shuddered and clutched the letter close to her heart. She had not cried then, and she would not cry now. Inspired by and linking to The Prompt hosted by Sara (Mum Turned Mom). So well-written, and such a fitting theme. And such a nice touch to add the postmarked date on the letter.